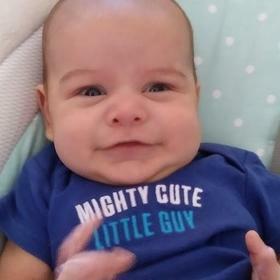 Kristopher Jeffrey Thompson, 10 weeks of age, went home to be with the Lord on Tuesday, February 5, 2019. Baby Kristopher was born to Jeffrey and Crystal Thompson on November 20, 2018. He will be remembered for his big smile, love for being held and his beautiful eyes. Baby Kristopher is survived by his loving parents, Jeffrey and Crystal; sisters, Nella, Niah and Emilly; brothers, Justin and Brandon; grandparents, Laura Burroughs, Billy and Lillie Lampe; Aunt & Uncle, Stacy and Dewey Mourer; special family friend, Steven "Two-Dogs" Potter; many more loving extended family and friends. Professional services entrusted to the Dykstra Funeral Home - Northwood Chapel.